The first video examined was one posted on Instagram, with the location tagged as Neznamovo (Незнамово), south of Stary Oskol and uploaded on June 23rd. First observation upon watching the video is that at the beginning of it the vehicles of the convoy are on a road slightly elevated compared to the vehicles where the video was filmed from, sloping downwards as the clip progresses and finally merging with the main road. 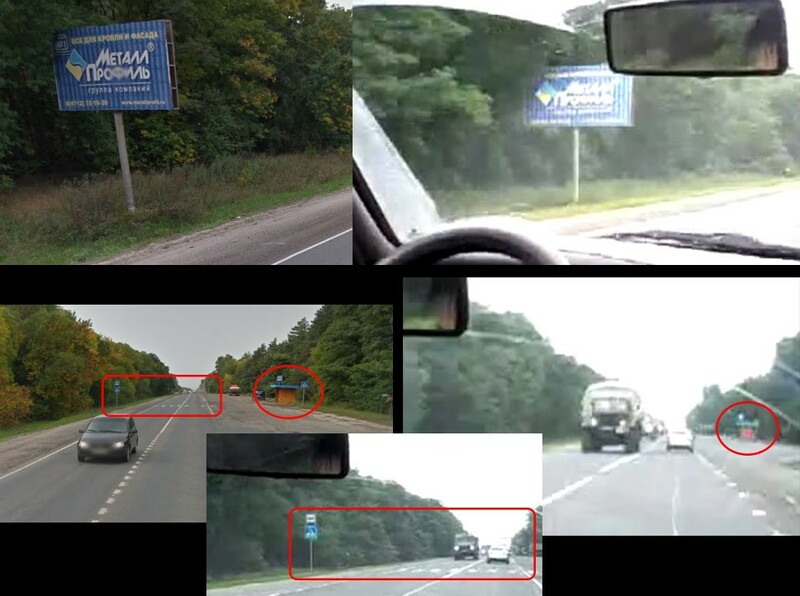 The second video referenced was posted to VK on the morning of June 24th, said to show the convoy in Alexeyevka (Алексеевка), also referencing ‘Magnit’, a major Russian supermarket chain. This narrows down the search area, and section of the road where the trucks are turning give a good reference point to look for in satellite images. 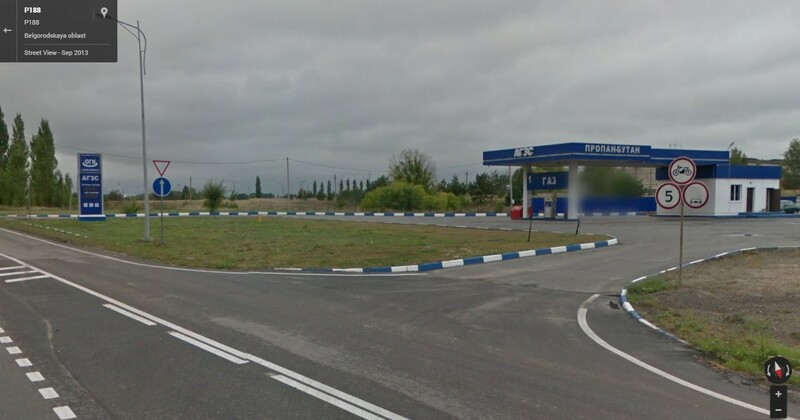 A Yandex map search for “Алексеевка Магнит” for gives list of seven locations, one of which is next to a section of road which resembles the area where the trucks can be seen turning. A third video, reportedly from Stary Oskol, seems to have been filmed at dusk or dawn. Viewing the metadata for the video reveals the upload time to be 04:16 ‘Zulu time’, another term used for Coordinated Universal Time, a.k.a. UTC. During the summer months Ukraine is on daylight savings time, meaning the time difference to UTC is +3 hours, so the local upload time of the video has been 07:16 in the morning of June 24th. 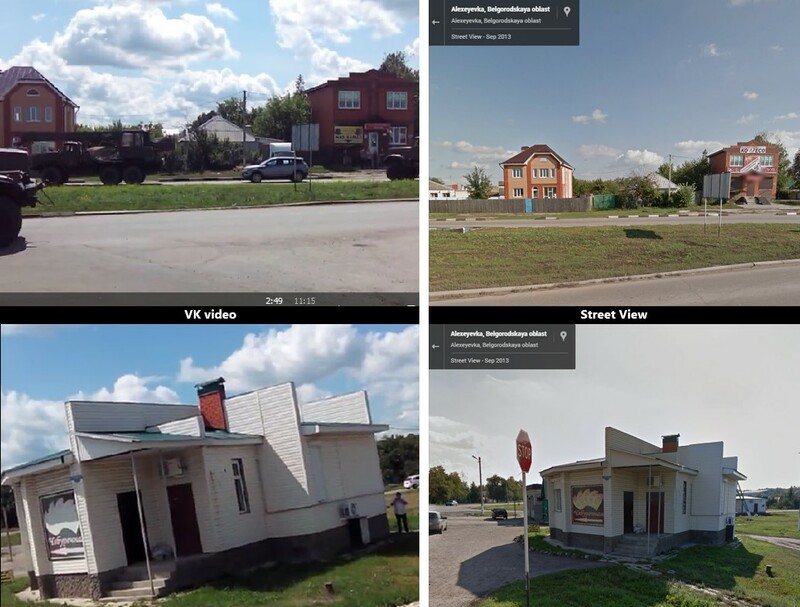 The video alone provides a few clues about the shooting location, but it’s useful to first look at the other videos to narrow down the search area. Video number four shows the convoy of vehicles during the daytime, reportedly at Krasnensky district of Belgorod oblast. The scenery in the video appears to show countryside with scarce buildings, but it does offer some details for analysis. First, there are fairly long stretches of straight road, with a curve at around 1 minute into the video. Near the curve, a pair of bus stops is visible, as well as an intersection and a tall structure to the right. Two minutes in, two large structures are visible to the right of the road. As the third video’s upload time was morning on June 24th, it likely was shot sometime between the Neznamovo and Raskhovets videos. With the knowledge of the shooting location of the previous videos, it’s possible to make estimations of the routes the convoy may have taken between Neznamovo and Raskhovets. One such suggested route goes through the village of Gorodishche (Городище) in the Starooskolsky district. In the video, some small buildings are visible on both sides of the road, mixed together with trees. Gorodishche matched this description, warranting a further look. 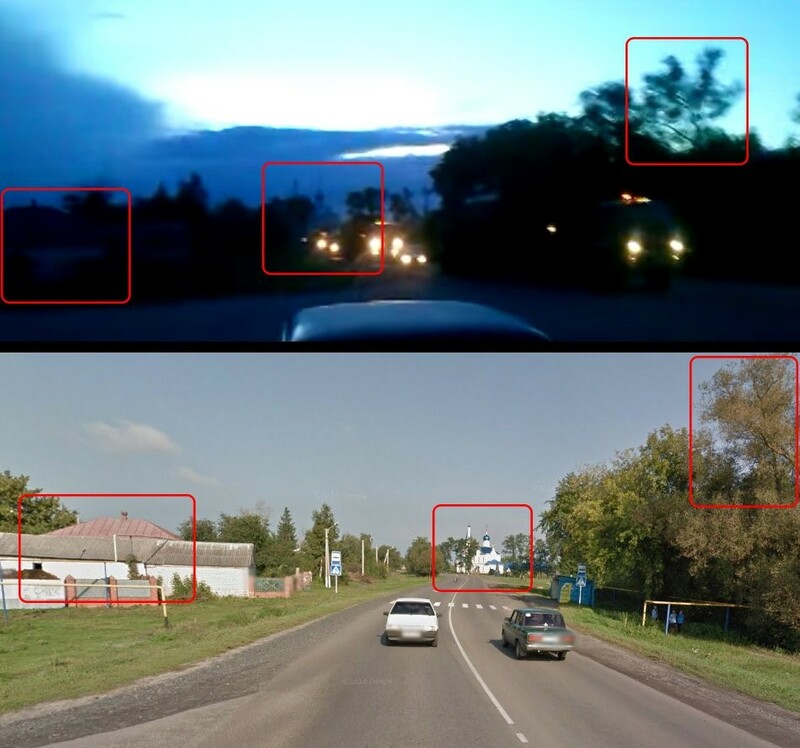 While not referenced in the published article, Magnitsky had located another video of the same convoy, again from Stary Oskol. The video is fairly short and shaky with lots of panning, but the units are clearly identifiable. With the footage, it was possible to create a rudimentary panorama to get a better sense of the overall area where the video was filmed. From the footage, a few key details stood out: on the very left of the scene, rails and cables are visible. This seemed to indicate the footage might have been filmed near a light rail or tram station. English Wikipedia confirmed that there was one operating in the city, and Russian Wikipedia provided more details on this. It became apparent the Stary Oskol light rail operated on a single rail line, so checking the assumption would be fairly simple: find the end of the line, and follow it down to see if there are any matching locations. Further searches for additional material from the same dates has uncovered another video from Kursk, reportedly from June 23rd, the same date the convoy had been filmed passing through Stary Oskol. 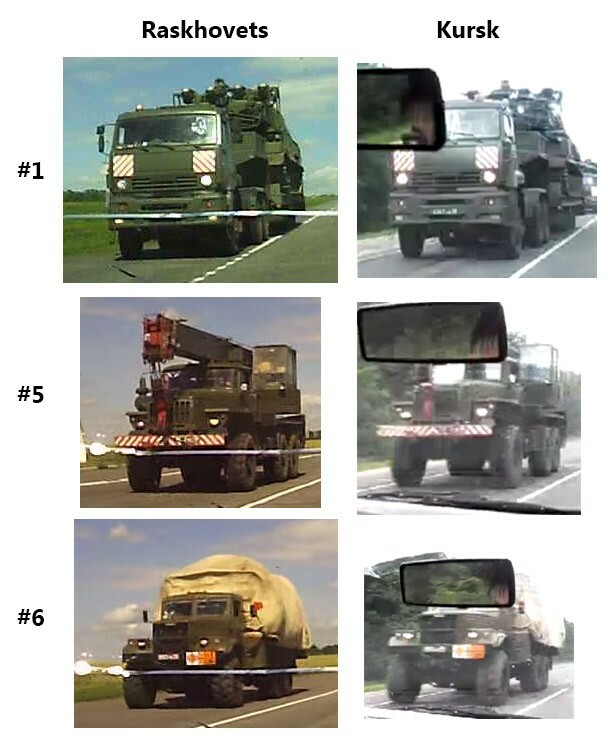 The dashcam video is of poor quality and many details are not visible, but composition of the convoy gives a strong indication this may indeed be the same one. 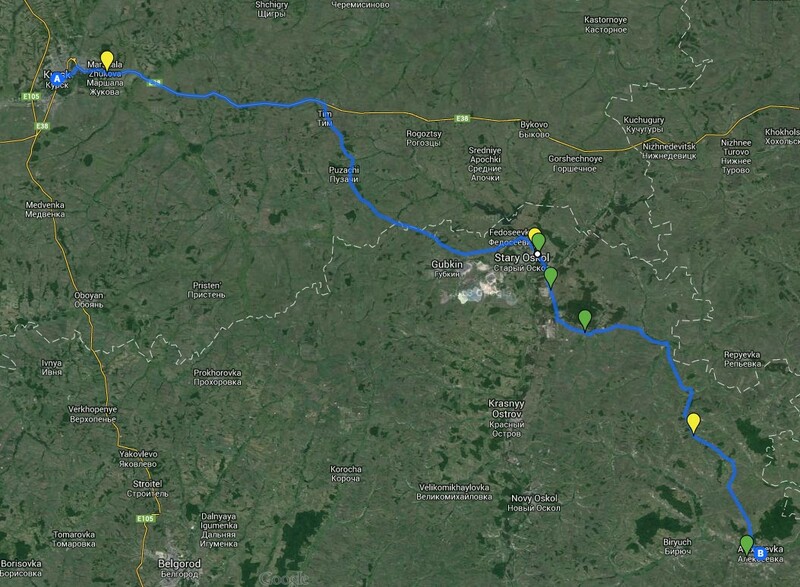 In fact, compared to the convoy seen near Raskhovets, the first 16 vehicles seem to be in the same order. Putting all these data points together we can plot these points on a map, which would fit on a possible route from Kursk to Alexeevka. 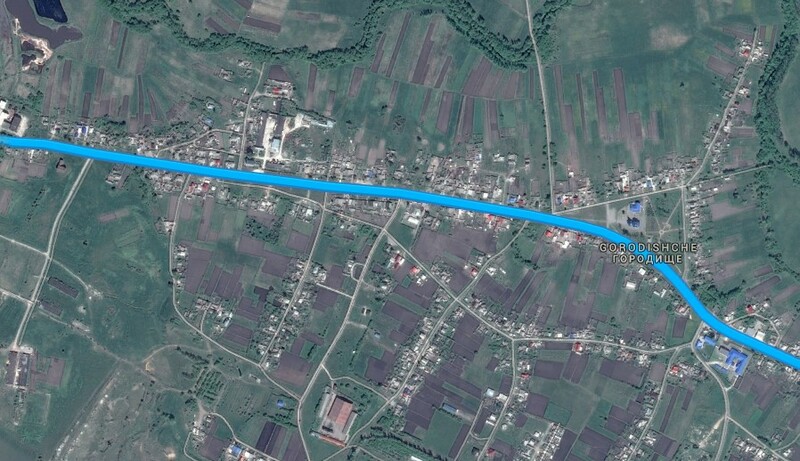 Compared to the shortest routing suggested by Google, only one manual adjustment to the route has been made in Stary Oskol, which adds 1km to the route, but avoids smaller roads and turns. The green markers show the locations at which the BUK unit had been filmed as part of the convoy, and the yellow markers show where other vehicles of the same convoy were filmed. It seems to me that you are operating with a pre-conceived bias. Now if you were investigating both sides of the story, you would have been tracking Ukranian convoys as well. Your site is a good idea but when you come up against a hurdle that would throw doubt on the main stream media propaganda view you just express a lack of understanding. The obvious flaw is your source identity, if Ukranian, they are just parading this convoy for a propaganda video. Try both sides of the argument and see what you get. You obviously have the tools. Mikhail, in a universe where reality is merely a story, and facts are negotiable, and reason is a form of belief, then you would have a point. But not in this Universe. Bellingcat is a fact-checker. They tracked only this particular Russian convoy (and not any other (Ukraine or Russian) convoy), because BUK 3’2 in this convoy from the 53rd BUK brigade in Kursk has been photographed in Donetsk on the morning of the 17th. So the BUK photographed in Donetsk on the morning of the 17th is from Russia, and NOT from Ukraine. Nothing that any “main stream media propaganda” from Western or Russian media. can change about that. Rob, with all due respect for your support of this investigation, when I see a heading like this:”Images Show the Buk that Downed Flight MH17, Inside Russia, Controlled by Russian Troops.” I want to see the evidence to support it. I cannot find it on this website and that grieves me. I do love the way that Bellingcat does it’s research but the sources are available to it are mostly social media. How do we know that ‘Iggy’ is a Russian investigative journalist, or anything much about him at all. The truth is that in this precise universe reality is just a story until we get conclusive evidence that it is not. I love this website but I want to be able to see both sides, not the biased westernised view of things with misleading sources. I think you misunderstood my comment on your assertions of “bias” and not investigating “both sides of the story”, and now your claims of a “biased westernized view of things”. 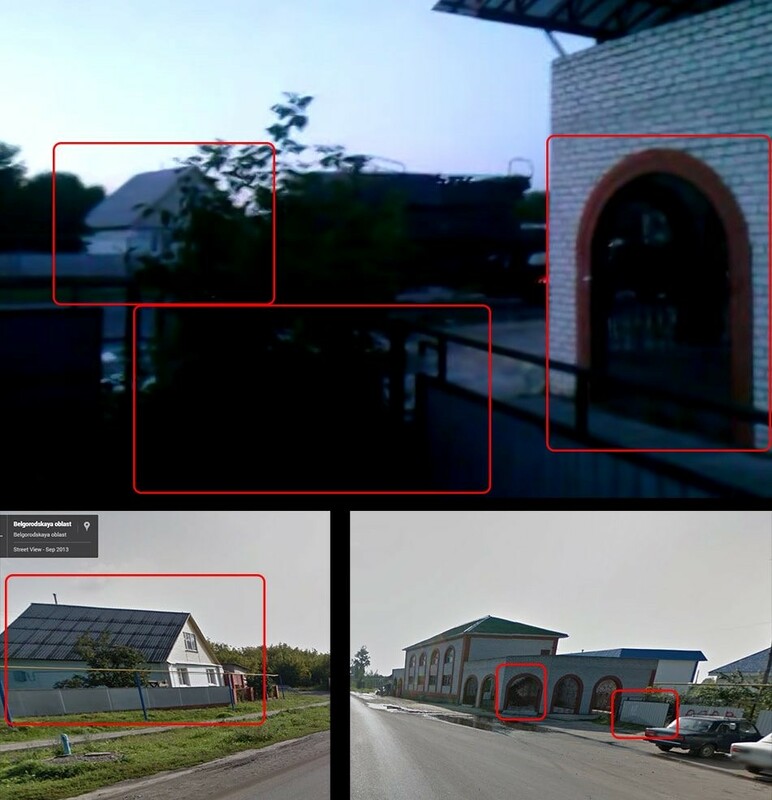 If you find any mistake or bias (western or not) in Bellingcat’s findings that a BUK system from the 53rd BUK brigade in Kursk appears in Donetsk on the morning of the 17th, and subsequently traveled to its launch site in Snizhne, then why don’t you present SOME evidence that “the other side of the story” even exists ? Please show me the evidence, where is the verified photo of this BUK in Kursk. There is too much supposition that a BUK was the cause of the MH17 disaster let alone saying that this is the BUK that brought it down. Another article says this BUK is linked to the disaster, I can go along with “Linked” but wonder about the sources that link it. The neural connections of the gut to the brain says there is something about the whole setup that stinks to high heaven when you consider who gains and who loses. All we want is the truth of the matter and considering the secrecy of the investigation, denying the relatives of the victims access and giving veto rights to the outcome to include Ukraine and of all people Tony Abbot, the smell gets even worse. Yeah. Why not vent another Gish Gallop of empty accusations without presenting ANY evidence. Look Mikhail, I lost 198 of my fellow citizens in this disaster. I have had to endure 5 months of a constant stream of lies and empty allegations without evidence from the Russian media, from the Russian Defense Ministry and from internet commenters like you. Another day, another lie from the Russian propaganda machine about MH17. And THAT is what truly stinks. Rob, Happy Christmas and best wishes. Look I fully agree with you, but in this unreal universe the propaganda is world -wide. I like to take the holistic view of things. Lies is rampant today, perhaps it has always been so to keep control of the rapidly increasing population. The plan seems to be to keep the people in fear. If you live in fear you will want the security provided by the PTB who also live in fear that they will lose control. You don’t need me to tell you that. Your government has taken on the responsibility of the investigation, do you trust them to publish the truth? Or do you wonder if certain powers will influence them with monetary gain, blackmail or the best excuse, national security reasons not specified. I have have seen your posts on other sites and it seems to me that your expertise is from an academic background. I don’t know, but could be that you are an intelligence agent also. However the world is my oyster and what I see is a population waking up to the machinations of the those in control. I don’t know who or what is responsible for MH17 or the previous Malaysian plane disappearance. As you say lies, lies and more lies. We are seeing more whistle-blowers coming out, the torture report published, (well, a percentage of it anyway) and it will be interesting to see what comes of the MH17 investigation in 2015. I hold no bias either way, just a seeker of truth, that is why I read this site and watch the exchange of comments to get an overall picture of what people think. If you’re wondering, I am a British subject with permanent residency in Australia.Cheers. Merry Christmas to you also Mikhail. May peace be with you. Какой кошмар, русские по своей территории перемещают военную технику, совсем оборзели. Это же где это они столько наглости набрались, что бы вообще в своей стране размещать свою военную технику, да как они смели. Just random similar photographs. It’s not a geolocation.